Create a tiny Tiny85 controller board that drives some NeoPixels and turn it into laser LED light display. The full build process is in the video but I have included some additional diagrams below to help with the component placement and using the ATtiny85 in the Arduino IDE. I have also included design files for a laser cut base and a 3D printed base, but I also show in the video that you could easily build a base for the display out of foam-board. 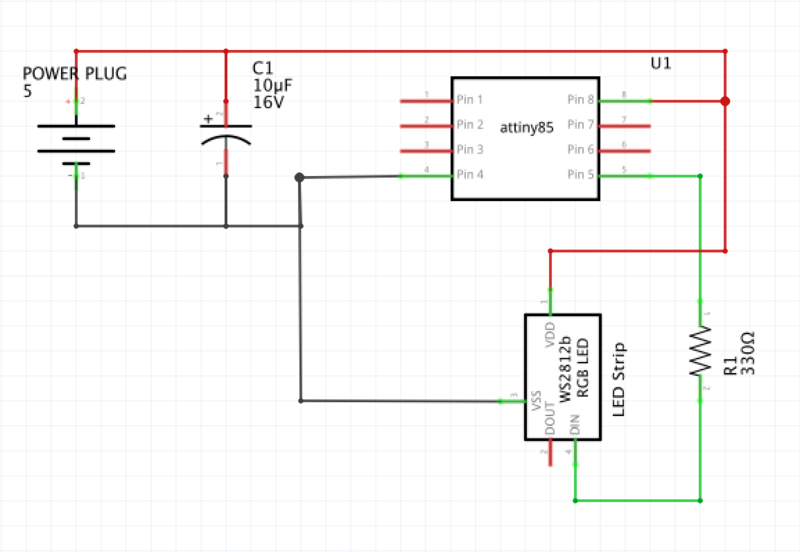 The you need to program your ATtiny85 with any neopixel library code you want. To use the ATtiny85 in the Arduino IDE, you will need to add the following board link to the Additional Boards Manager URLs area of the Arduino IDE Preferences.. I hope you enjoy this project and decide to take on the challenge of making it or something similar! Follow me on Twitter, Facebook, Instagram & Tindie. This code is the StrandTest code from the NeoPixel library, but with modifications to make it work on an ATTiny85 - You will need to install the Adafruit Neopixel library.